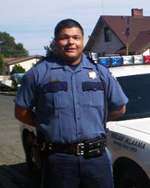 Eric Rodriguez has several years of public service employment with the Yakama Nation and Pojoaque Pueblo Tribal Police Departments. Eric was a Firefighter/EMT at Yakima County Fire District 5 and Wapato Fire Departments. Eric is a graduate from the Federal Law Enforcement Training Center (FLETC)/Indian Police Academy in Artesia, NM. Eric is completing his B.A from American University in Washington, DC, and plans on attending the Pre-Law Summer Institute for American Indian Students at UNM School of Law. Eric is a member of AISES and SACNAS and volunteers at tribal youth events. Eric is Gros Ventre/Assiniboine from the Ft. Belknap Indian Community in Montana and a descendant of the Yakama Nation.